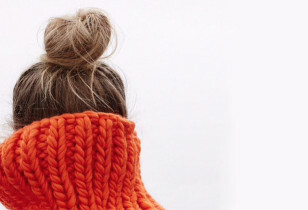 Winter weather can wreak major havoc on your regular scheduled beauty routine, unless, of course, you plan on hibernating until spring. With the dramatic drop in temps, it’s important to switch things up and keep your rotation working for you. From skin quenching creams and balms to supplements and superfoods, see what our Editors are grabbing for during this chilly season, below! “My friends Jen and Adriel recently launched an incredible line of all-natural balms and oils. I’ve been testing the products out (and loving them!) for about a year now, and I am so excited that they’re now available to the masses. 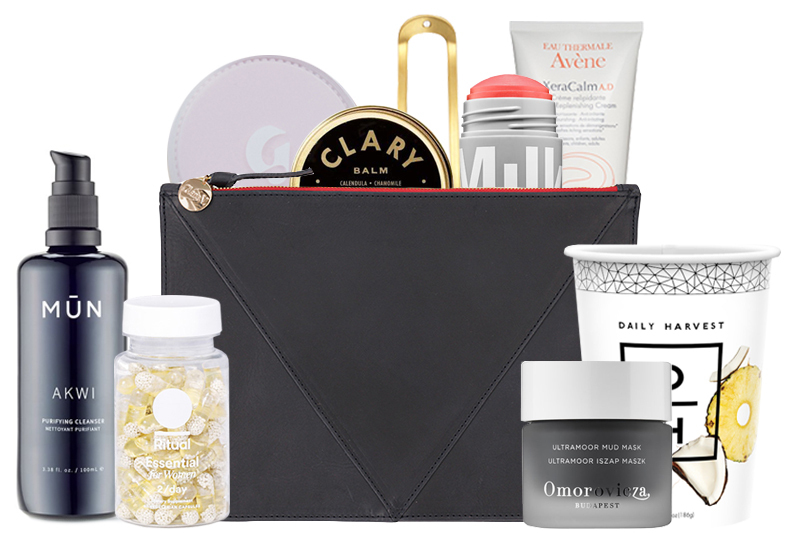 The all-purpose Clary Balm is my favorite. I keep one in my purse, one next to my bed, and one in the bathroom.” Clary Balm, $16.50, Clary Collection. “My skin gets very dry during the winter months and needs as much hydration that it can get. I am thrilled that Glossier (we just hosted a dinner with the brand’s team in NYC) has released a new face cream that is rich in ceramides and fatty acids to lock in moisture. I slather it on before bed, or during the day when my face needs a little extra love.” Priming Moisturizer Rich, $35, Glossier. “I’ve been using this mud mask for the past few weeks and I freakin’ love it. It has a cooling effect and really minimizes my poors and leaves my skin looking so smooth that I don’t even need to apply makeup afterwards. Keeping this one in my regular morning lineup, for sure!” Omorovicza Ultramoor Mud Mask, $125, Sephora. “I finally tried the very popular Milk Makeup after we profiled creator Georgie Greville on the site and I totally get the hype! I’m currently digging the Lip and Cheek stick in Perk. I love its blendable, natural looking, coral-colored hue.” Lip + Cheek, $24, Sephora. “Oil cleansers are my jam! I have always favored Eve Lom’s Cleanser over, pretty much, all other oil-based cleansing methods, but the new Akwi Cleansing Cream from Mūn is right up there with it, and holding strong. It comes out of the bottle as a cream, but melts into an oil, wiping away makeup, oil, and dirt with ease. Highly recommended!” Akwi Purifying Cleanser, $60, Mūn. “I have been trying not to tie my hair up with elastic bands anymore because I’ve experienced a ton of breakage. This gold hair pin is not only beautiful, but it pulls my hair back without the damage and looks much more elegant. It does take a little bit of practice, but once you get it, you’re golden. I love it so much that I gifted one to a long-haired friend of mine for Christmas, too.” Sylvain Le Hen Epingles 014, $65, Jenni Kayne. “A friend of mine introduced me to these all-in-one vitamins that contain nine essential ingredients that women lack most. I just placed and order and cannot wait to give them a test-drive.” Ritual Vitamins, $30/month, Ritual. “As I mentioned above, my skin and winter weather don’t mix. I have to pay close attention and keep hydrated or else I experience irritation. This body cream by Avene has been an absolute lifesaver! I use it on my kids’ eczema, too.” Avene XeraCalm A.D Lipid-Replenishing Cream, $32, Amazon. “I am a firm believer that beauty really starts from within, so I love a drinking a morning smoothie or juice loaded with plenty of good stuff to keep me healthy and feeling my best. Some mornings are harder than others, and it’s not always easy to find the time to prep and mix before work, so I was thrilled to learn about these ready-to-blend, superfood smoothies that are delivered directly to your doorstep. Signing myself up, stat!” Smoothie Delivery, starting at 6.99 per smoothie, Daily-Harvest. 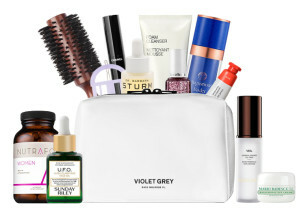 James’ beauty bag choice is by Clare Vivier. “I love the idea of switching one’s fragrance as the year unfolds. The L.A.-based small-batch fragrance company Dasein makes it simple, with four scents titled after each season. The Winter version has notes of cardamom tea, lavender, wild musk, coastal forest, and driftwood bonfire. In other words—a whiff of California’s ‘winter. '” Dasein Winter Unisex Fragrance, $95, BirchBox. “I know I’m not the only one obsessed with OLLY gummy vitamins. This beauty-themed bottle promises bright eyes, dewy skin, and healthy hair after popping two a day. Even if it’s just a placebo effect, you get to eat gummies!” OLLY Undeniable Beauty Gummy Supplements, Grapefruit Glam, 60 Count, $19.99, Amazon. “Our lovely L.A.-based photographed Nicki Sebastian recently sent me a beautiful Simone LeBlanc giftbox with a few packets of this body polish in it. Turns out it’s made in small batches in Colorado, and is a mix of Dead Sea mineral salts and grapefruit and rosemary essential oils. The perfect addition for those way-too-rare relaxing baths.” Formulary55 Sea Mineral Body Polish, $7, Formulary55. “It was such a pleasure hanging out with the ladies of Glossier for our fun dinner in New York this month. The gift bags were killer and I finally got my hands on the much revered Boy Brow!” Boy Brow, $16, Glossier. “I’m keynoting at ALT Summit next week, and since the event is in Palm Springs, it’ll also double as a girls’ trip for a few of my friends and I who are heading down there. I’m excited for a few dressed-up nights and to try out a colorful smokey eye using this new palette.” Butter London Palm Paradise Shadow Duo, $15, Amazon. “Like the majority of the folks I know, 2017 means a focus on self-care. I’m going to start a new program with Parsley Health, which focuses on ‘health coaching’ way before you ever get sick. I’m also going to try dry brushing my bod, which is said to have numerous health benefits.” Dry Brush, $7.69, Amazon. “This spray claims to change the energy of you or someone else. Also, a few spritzes supposedly ‘aids in boosting physical or magical activity.’ At the very least, it smells good, thanks to a mixture of ginger, peppermint, sweet orange, black pepper, and dark patchouli essential oils.” White Magic Energy Spray, $16, Species by the Thousands. “A punchy shade of pink for that aforementioned jaunt to Palm Springs.” Butter London Trout Pout Patent Shine Nail Polish, $18, Need Supply. Katie’s beauty bag choice is by Forever 21.